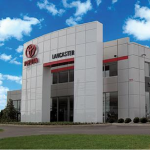 Lancaster Toyota designed their new service facility from the ground up to be the most efficient in the area. To drive volume the shop needs to service new vehicles, out of warranty and non-toyota vehicles with equal speed and efficiency. 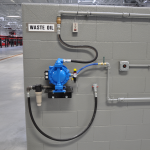 The solution is to deliver 2 grades of bulk oil, washer fluid, air and electricity to all 32 bays through overhead reels. 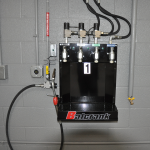 Three additional bulk oils, ATF and coolant are delivered to the lube bays through oil bars. 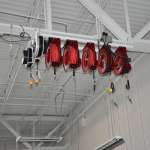 The bulk system cuts inventory costs with volume purchasing and the elimination of case goods. 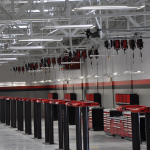 Still greater savings are realized through productivity increases by keeping technicians in their bays, delivering oil directly to the vehicles and automatically tracking and recording each oil dipense. 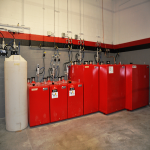 The Fluid Inventory Control (FIC) system makes sure every oil service gets billed and the tank levels tie out each month. The net result is a new facility that completes a broader range of services, faster and more efficiently, driving back end volume and profits.